Welcome to the first in a series of posts highlighting exciting features staff and students can expect to find in the university’s new virtual learning environment (VLE), Canvas. Each of these posts will showcase a great feature within Canvas that you can use to enhance you and your students’ experience. Canvas will be used for all Sussex modules from the beginning of the 2018/19 academic year. We’re going to start with something nearly everybody uses, quizzes. In Canvas as you’ll see in the brief intro video below, quizzes are easy to set-up, author and build into your assessment cycle. Canvas allows you to schedule the same quiz at different times to different groups, for example for students with reasonable adjustments, and makes it easy to provide feedback for correct responses, incorrect responses, general comments and per answer option. We think you’re going to love the reliability and how easy it is to create and administer quizzes. We look forward to introducing you all to the tools over the next few months. We’ll be running lots of training on using Canvas and quizzes, so watch this space for more information coming soon. 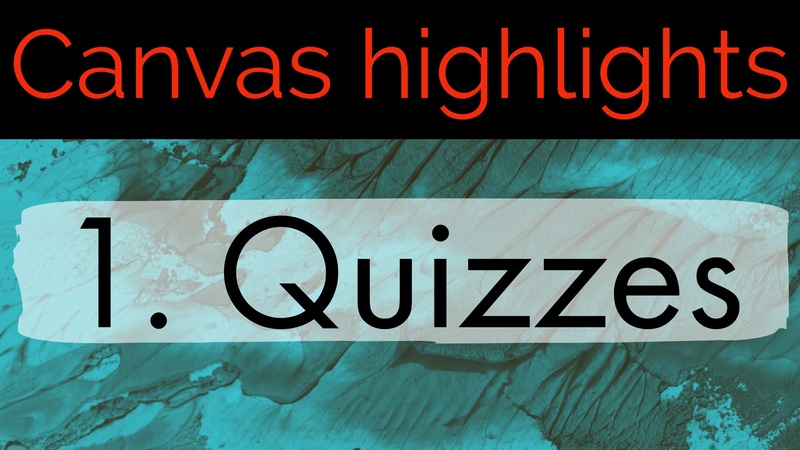 For more information on the quizzes see also the Canvas community help pages for an in depth look at how to make the most out of this essential and powerful tool in your new VLE. Canvas quizzes seem to be much better than the Moodle/Hotpotatoes ones. Not surprising given the age of the latter. However it would be good if existing scorm compatible quizzes that users have could be uploaded to Canvas and then linked to rubrics etc. Will this be possible? You currently can’t link a SCORM package to a rubric. They can be assigned to all other assignment types. However it is something we can ask of Canvas, or put in a feature request.